The long-running and generally excellent science documentary show on PBS, NOVA (funded in part by the David H. Koch Fund for Science, whose libertarian eponym -- despite evident philanthropic gifts all over New York City -- is a bête noire of the Left), began its 2019 season with a show about quantum "entanglement." This went back to the 1935 paper by Albert Einstein, Boris Podolsky, and Nathan Rosen that challenged quantum mechanics with the accusation that it would violate the limitation of the velocity of light postulated by Einstein's theory of Special Relativity. This is the "EPR Paradox." Hence the title of the show, "Einstein's Quantum Riddle." Einstein called it “spooky action at a distance,” but today quantum entanglement is poised to revolutionize technology from computers to cryptography. Physicists have gradually become convinced that the phenomenon -- two subatomic particles that mirror changes in each other instantaneously over any distance -- is real. But a few doubts remain. NOVA follows a ground-breaking experiment in the Canary Islands to use quasars at opposite ends of the universe to once and for all settle remaining questions. In a way, this is old news, as the show seems to concede. Einstein's "riddle," whose terms I will consider in more detail below, was for many years only of remote theoretical interest. The complacency that attended the interpretation of quantum mechanics saw no real challenge in the EPR paper, and it could be ignored. As it was. However, when John Bell (1928-1990) wrote an equation, Bell's Theorem or Bell's Inequality, that could be used to test the predictive difference between standard quantum mechanics and the more realistic theory prefered by Einstein, this finally got some attention. The predictions of quantum mechanics were vindicated by the experimental tests, something that disappointed John Bell himself, since he thought that Einstein's objections made more sense. The NOVA episode examines this history and moves on to matters of current interest, including the Canary Islands test of Bell's Theorem. However, the complacency about the interpretation of quantum mechanics persists; and some very precise stigmata can be identified in the show that betrays this attitude. Thus, the documentary includes no mention whatsoever of the "wave function," based on Schrödinger's Equation, or the phenomenon of the wave/particle duality. These are not optional features of quantum mechanics. Indeed, the picture of quantum mechanics presented, based on Bohr's "Copenhagen Interpretation," passes over Bohr's own "Complementarity" principle, which addresses the wave/particle duality. The statement "the wave function itself... has no physical significance" is false and betrays the nature of the bias we see in the NOVA documentary. But this is not an unusual idea, which we actually see in Carlo Rovelli and expressed by Richard Feynman, who says that "the wave theory collapsed" in the photoelectric effect. But Feynman also must acknowledge the wave/particle duality, and he expresses the hopelessness of explaining all this, as "theoretical physics has given up on that." If we apply this to the wave/particle duality, as Marion immediately does, this contradicts the statement that "the wave function itself... has no physical significance"; for if the waves have "no physical significance," then they do not qualify as something where "an experiment allows us to observe one aspect of a physical phenomenon." If waves have "no physical significance," then they are not something that we could observe in a "physical phenomenon" [note]. So what is the "physical phenomenon" that we can observe that gives the wave function a "physical significance"? First and most important of all, it is the interference effects that were observed by Thomas Young (1773-1829) that confirmed the wave nature of light, previously a matter of speculation, and the similar effects predicted by de Broglie that were then observed in the case of electrons. But there is a lot more to it than that. A single electron going through Young's slot experiment, where the particle can go through one slot or the other, actually interferes with itself, and produces the same interference effects seen with multiple photons or electrons. How the hell does that happen? Well, somehow the electron must go through both slots at once. If we put detectors on the slots and determine where the electron goes, the interference disappears. And we cannot say that the detectors disturb the electron; for if only one detector is on only one slot, and it simply reports, by inactivity, that the electron didn't go through that slot, the interference still disappears. The electron knows that we know where it went. This is a very bizarre result, but there is clearly a very simple way to explain it. The physical wave is extended in space, can go through both slots, and can interfere with itself. Jerry Marion's "the wave function itself... has no physical significance" is falsified by this. And Complementarity sorts it out quite nicely. When the cat is away, the mice will play. Thus, if we do anything that will locate the electron, it behaves as a particle, with a discrete, indeed a Dirac point-like location (with the further uncertainty about its position and momentum). But if we don't do anything to locate the electron, it behaves as a wave. Thus, even when the electron passes through both slots and interferes with itself, only a discrete particle can strike a phosphorescent screen and illuminate a location. The interference pattern in this is evident in the distribution of strikes, as individual electrons pass through the slots. One would never know this from the NOVA episode. Instead, in the graphics of the show, we see a "probability cloud," like wisps of fog, moving along where the physical wave would be traveling. This is coupled with the Copenhagen Interpretation that "nothing exists" until it is observed and measured, leaving the obvious paradox that something that "doesn't exist" nevertheless is being shown as part of a physical process -- while the wave function has no "physical significance"?! The metphysics of such a theory and presentation only allows for a "mind only" ontology, in line with the schools of "Idealism," like Hegel, where external objects only exist because of their presence in consciousness. Neither the producers of NOVA, nor perhaps the talking head physicists featured in the show, were advised by any perspicacious philosophers about the problem with such a thing. Bohr himself was philosophically naive enough not to follow through with the implications of the anti-realism of his Interpretation, which is what bothered John Bell (and Einstein) about him. Nor can this "probability cloud" be used like the original wave function to explain interference effects; for the probability function is the square of the wave function, which eliminates any negative magnitudes, the very things that zero out the positive magnitudes in the interference effects. Nevertheless, this muddle, as we see from Jerry Marion, Carlo Rovelli, and Richard Feynman, is not unusual. But in the case of the NOVA documentary, we want to see how this bias and confusion affects the presentation of the phenomenon of quantum entanglement. 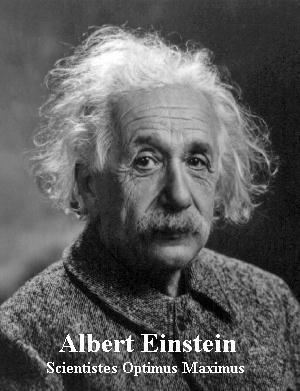 Einstein's "quantum riddle" concerns the effects of superposition and the attendant indeterminacy in quantum mechanics. In the diagram at left, named after Richard Feynman, we have an event where an energetic photon has created a pair of particles, one as ordinary matter, an electron (e-), the other as anti-matter, a positron (e+). They shoot off in different directions. But which is which? We don't know. And this means that the wave function contains both, where there is a probability of 50% that either one can be the electron or the positron. We won't know until we look, or one hits some kind of detector. Then the wave function collapses, and we get discete particles. But if we look and find an electron, then the other particle, wherever it is, must be the positron. So far, this is not so mysterious. When we look, we just find out which is which -- the way they were already. In quantum mechanical terms, however, each particle must be both particles before we observe either one. Neither is already the kind of particle we find when we observe -- that is ruled out as a "hidden variable" theory. Nothing is "hidden" in quantum mechanics. In the diagram, we see the sum of both particles divided by 2 because the probability, when the expression is squared, must be one -- i.e. (1+1)/2=1. This was the point of Schrödinger's Cat, that, if the cat might be dead, the cat must be both dead and alive until we observe it. Schrödinger found this bizarre, and falsifying, as would Einstein. What turned this into the EPR Paradox is two things: (1) When the wave function collapses, its does so instantaneously, even across cosmological distances. This violates Special Relativity, where nothing can propagate faster than the velocity of light. And (2) One particle assuming definite form would seem to cause the other particle to react, even across, indeed, cosmological distances. This is what Einstein called "spooky action at a distance." Bell's Theorem made it possible to test (1), and it turned out that the predictions of quantum mechanics, instantaneous collapse and all, are born out. Testing (2) is a different matter altogether. Violating the velocity of light is not "spooky" the way an invisible influence through empty space is. The metaphysics of this is the real hang-up, among people who don't know anything about metaphysics and probably want nothing to do with it. But there is really nothing "spooky" about action at a distance. This was Newton's entire theory of gravity. The Earth, Moon, and Sun all attracted each other across the Void; and the only explanation that Newton ever had for this was that it is the Will of God -- something also invisible. At the time, nobody liked this very much; but, as with quantum mechanics, the math worked. But neither Einstein's theory of gravity, in General Relativity, nor the principle of the interactions of forces in quantum mechanics, using virtual particles, were theories of action at a distance. Something mediated them -- space itself with Einstein, those virtual particles in quantum mechanics. The device of neither theory, however, seems to cover this case. Einstein's space doesn't fit the quantum setup; and quantum mechanics is not positing that virtual particles pass instantaneously from the electron to the positron. This leaves us with Feynman's confession that, "the way we have to describe Nature is generally incomprehensible to us." Or is it? What is the cost of the NOVA documentary ignoring the wave function and the wave/particle duality? Well, it leaves out the "physical significance" of the wave function. The quantum "entanglement" of the particles with each other is an artifact of their both being part of the same wave function. The same electron cannot go through both of Young's slots as a particle; but the same electron can go through both slots as a wave. The same electron and positron cannot be in both locations as particles, at possibly cosmological distances, but they can be at both locations as waves. The particles are not just "entangled," they are superposed, i.e. they are mixtures of each other, as (e-+e+)/ 2 -- like Schrödinger's Cat being both dead and alive. There was no hint of this in the NOVA episode, but superposition (or Schrödinger's Cat) is not an optional part of quantum mechanics. Leaving out the wave function, the wave/particle duality, and superposition means that only a fragment of quantum mechanics is presented, a fragment that offers nothing more than the foggy wisps and non-existence of the "probability cloud" to explain how the electron and positron get to the positions where their identities are specified. This failure of the documentary is of general interest because it is characteristic of the bias, confusion, and oversights that obviously exist in the interpretation of quantum mechanics -- as we have seen from Jerry Marion and Richard Feynman above, to the producers and the scientists in "Einstein's Quantum Riddle." When the answer, in a way, is really so simple, that the wave function bridges the "spooky action at a distance," we must ask why it is so obviously overlooked. Something about the wave function makes a lot of people nervous, and perhaps it is because of the dualistic metaphysics that is implied by it, a dualism described by Roger Penrose and Freeman Dyson, and examined in these pages as "Kantian Quantum Mechanics." The ontological absurdity, or Hegelianism, of the Copenhagen Interpretation is something people can avoid facing, even as it stalks their speculations and reasoning. But the avoidance is either bad faith, or fear. The fear, perhaps, is that if they looked, the trap would spring and they would be caught in a "mind only" metaphysics. Or the fear may be the unconscious sense that something ought to be done to avoid that trap, even while their physics or math degrees never prepared them for a task involving metaphysics. 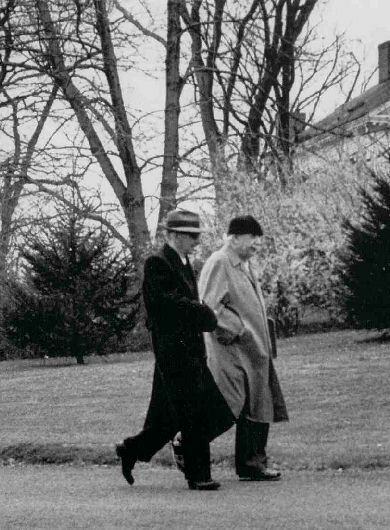 They might have done better walking to the Institute for Advanced Study with Einstein and Gödel, discussing Kant. In physics ... the possibility of knowledge of objectivizable states of affairs is denied, and it is asserted that we must be content to predict the results of observations. This is really the end of all theoretical science in the usual sense. A recent example of Marion's point of view is in The Wall Street Journal of February 9-10, 2019 [p.C9], "Choosing Words Carefully," by N. David Mermin, a review of the book Beyond Weird by Philip Ball [University of Chicago Press, 2018]. N. David Mermin (aged 83) is a professor emeritus of physics at Cornell University. Philip Ball has been an editor at the prestigious journal Nature and, with degrees in chemistry and physics, writes on scientific issues. Beyond Weird is about the, indeed, weird fetures of quantum mechanics. ...there never has been any common understanding of the meaning of the mathematical astractions in which it is expressed. There are nearly as many different "interpretations" of quantum physics as there are physicists and philosophers who worry about what it all means. The only thing all interpretations have in common is that each of them is weird, in its own special way. If one is not advocating a particular interpretation then there is far more to say than can fit in a single book. Much of what is claimed is wrong, but there is no agreement on which claims are right. Finally, because the weirdness stems from an inability to make sense of the mathematics that underlies the predictions of experimental data, a writer must invent awkward circumlocutions to spare the nonmathematical reader. This is probably about the size of it. However, I might be left a little uneasy after these statements about what they reveal of Mermin's understanding of the relationship bewteen mathematics and the interpretation that gives it an application to the world. Starting off, I take Mermin to be giving us the proper additional sober warning that, just because the math works, doesn't mean we know what is going on. Karl Popper claimed that we never know what is going on. The notion that the mathematics itself provides the physical or metaphysical interpretation has been called the "Sin of Galileo." But from his references to mathematics here, I am left suspicious that Dr. Mermin may confuse the mathematics of quantum mechanics with the intepretation that gives it physical or metaphysical application. The problem is not really going to be our "inability to make sense of the mathematics," but our inability to make sense of the concepts and theories through which the mathematics is applied to phenomena. In a way, these are some very astonishing statements. However, it is no less than we would expect of Mermin if he has accepted a very strong, anti-realist version of the Copenhagen Interpretation of quantum mechanics, in which nothing exists until it is observed. Note that Mermin allows for observation here only on the outcome of any quantum event in a physical system. So far, so good. This may be what everyone might agree on. But the "mathematical apparatus" itself cannot "yield" the outcome in the physical system that is to be observed. In other words, pure mathematics does not cause physical events. There must be an antecedent physical "state" that occasions the event we can see. This is something that Bohr left unexplained and that Mermin apparently does not think calls for any explanation. There are indeed mathematicians and scientists, modern Pythagoreans, who believe that mathematics is all that exists and that, as Alan Sandage (1926-2010) said, the world we see is just a "shadow on the wall." This may be what Dr. Mermin thinks; but I will continue as though it isn't. I suspect that Mermin is not a covert Pythagorean, but a metaphysical unsophisticate. Thus, although Mermin says that a "state" is a "mathematical quantity associated with a physical system," we have no idea what "associated" is supposed to mean. It apparently does not mean that mass belongs to the "physical system" the way mass belongs to a bowling ball, or an "unobserved thing" would have its own "properties," which Mermin denies. Since the stipulation is that these external objects are "unobserved," we must imagine a form of "association" for the mathematics to some object that is something, not only for which we have no empirical knowledge or perceptual connection, but that cannot possess the characteristics contained in the mathematical expression. This is a deeply muddled setup, which has nothing to do with the meaning of the mathematics in its own right, which Mermin thinks, confusedly, is where the problem lies. When Mermin says, "But in quantum physics unobserved things have no properties whatsoever," this can only mean that there is nothing definite or determinate about the objects of the physical world before we observe them. If so, then there is nothing about them that can determine the application of physical laws and cause changes productive of material events. If we then ask what causes material events, all that is left for someone like Dr. Mermin is our own observation. But then this is a kind of magical thinking. I make things, not just happen, but exist by looking at them. This is what Kant called an "intellectual intuition," which only belongs to God. Since I cannot make anything I want to happen or exist, my powers are limited -- I am not God. But limited by what? Well, the "mathematical apparatus" swings into action with my observation, a "mathematical apparatus" that most of us are entirely unaware of and would have difficultly understanding if Dr. Mermin were to try and explain it, which then produces the world perceived by our particular act of observation. Unless one is a Hegelian or other kind of Idealist (or Platonist), this is quite absurd. Thus, Mermin has seconded the assertion of Jerry Marion above, that "In fact, the wave function itself, ψ(x), has no physical significance and cannot be directly measured" -- which, remember, is false in its first point even if true in its second. But we might also note that what Mermin actually leaves out of his account is exactly what the NOVA episode, "Einstein's Quantum Riddle," leaves out, which is indeed the wave function, the very thing that Marion himself actually does address. When Mermin says, "But in quantum physics unobserved things have no properties whatsoever," he is ruling out, not some marginal, uninformed, or crackpot interpretation of quantum mechanics, but the actual interpretation of Louis de Broglie and Irwin Schrödinger, in which the wave function is a physical reality. These are not people who merit or warrant being ignored. In particular the fundamental term "superposition" -- a kind of sum of states -- makes sense only for states in the technical sense. "Superposition" has no meaning for colloquial states. "Colloquial states" means, of course, the external reality of material objects -- and it is curious that Mermin keeps saying "colloquial" instead of "material," "natural," or "phenomenal." However, adding wave functions, whether for quantum states, sound, or light, makes perfect sense and is a familiar physical phenomenon in nature. Thus, if musical notes can add together to make a complex sound wave, then de Broglie waves can add together and create a superpositioned quantum state, not just as a mathematical abstraction, but as a physical reality. As a result, Dr. Mermin's original caution, that "there is no agreement on which claims are right" in quantum mechanics" seems, at least, disingenuous. He knows that anything outside the Copenhagen Intepretation and its anti-realism is wrong. With that, however, he is left without a naturalistic explanation for the causes of physical events. The "mathematical apparatus" is what "yields" the physical reality; and in the wave-particle duality, particles are real and waves are not. Unfortunately, as with Niels Bohr, this conflicts with Bohr's own Complementarity principle, which is that a phenomenon can be interpreted as waves, or as particles, but not both -- if there is a question about which interpretation to use, then there must be some empirical datum we are considering. But both Jerry Marion and N. David Mermin seem to be saying that physical phenomenon cannot be interpreted as waves at all, since "in quantum physics unobserved things have no properties whatsoever," and waves are things that cannot be directly observed. So Dr. Mermin has devoted a good part of his review to a quibble over the meaning of a quantum "state," which itself precludes quantum interpretations that seem necessary, both for sensible metaphysics, and for a reasonable construction of Niels Bohr's own physics, whose remaining difficulties were just the kind of thing that persuaded John Bell that Einstein's objections to Bohr were reasonable and cogent. I think this is a poor kind of response to a book about interpretations of quantum mechanics. Indeed, anyone endorsing an anti-realist Copenhagen Interpretation should tell us what does cause and determine physical events, if "unobserved things have no properties whatsoever." Perhaps Dr. Mermin doesn't understand the question. Finally, because the weirdness stems from an inability to make sense of the mathematics that underlies the predictions of experimental data, a writer must invent awkward circumlocutions to spare the nonmathematical reader... The mathematics is actually not very difficult... But few general readers are acquainted with it. However, as we have seen, where the problem here has been the assertion that "unobserved things have no properties whatsoever," this is not actually a statement or description of the mathematics. It is an assertion about reality, about metaphysics, and about whether the "mathematical apparatus" refers to the world or floats off in some self-referential World of Forms. It is fine with me if Dr. Mermin is a Platonist or Hegelian; but if he isn't, he cannot in good conscience or conscientiousness leave us with a worldview where physical and natural events are not caused by physical and natural conditions (external quantum "states"), which is the situation with which a Copenhagen Interpretation leaves us. We could even say that Dr. Mermin's review adds up to a single polemical attack, not so much on Phillip Ball, but on Louis de Broglie, Irwin Schrödinger, and anyone else who holds to a Realistic interpretation of the quantum wave function. Again, perhaps he doesn't understand that this is what he has done. Indeed, since there is really nothing weirder or more famous in quantum mechanics than Schrödinger's Cat, it is a particularly acute, if not dishonest, failure of explanation if Schrödinger's own metaphysical opinion is overlooked. Our takeaway from the whole business, however, might be to notice what Dr. Mermin and the NOVA episode have in common: They both avoid saying anything about the wave function. But Schödinger's Equation is not something optional in quantum mechanics, which is why we hear about it in Jerry Marion's physics book and, as it happens, in the Emperor's New Mind of Roger Penrose. I think it is fair to say that Penrose is more of a heavyweight in the business than Dr. Mermin, and we don't get this "unobserved things have no properties" from him. We get no hint of the critical attitude of Penrose in Mermin's review.